Like clockwork, the constellations rise and set 4 minutes earlier with each passing day. Four minutes doesn’t sound like much, but it adds up after a while. For instance, the stars rise and set one half-hour earlier with each passing week, or 2 hours earlier with each passing month. That is six hours difference after one 3-month season. Tonight, the red supergiant star Antares rises in the southeast around midnight and at about the same time that Antares rises, the red supergiant star Betelgeuse sets in the west. For these stars’ precise rise/set times in your sky, check out the U.S. Naval Observatory. This evening, the waning gibbous moon will precede Antares into the southeast sky by about an hour. Tomorrow, a somewhat smaller waning gibbous moon will rise more or less with Antares. 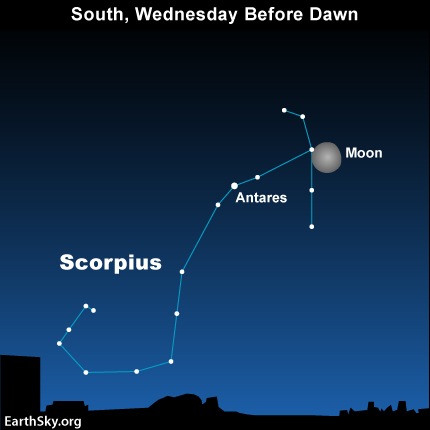 The moon and Antares will rise late on both nights. They will cross the sky westward together, and hover in the southwest sky at morning dawn. Antares beams as the brightest star in the summer constellation Scorpius the Scorpion, and Betelgeuse vies with Rigel as the brightest star in the winter constellation Orion. According to myth, Orion and the Scorpion are archenemies, so the gods saw to it that the two constellations never appear in the same sky together. By late May and early June, Betelgeuse will have disappeared from the evening sky, whereas Antares will shine from dusk until dawn!